Whilst I was traveling through New Zealand in search of surf, skate and snow in the summer of 2013 I met a lot of amazing people. One of the first places that I settled for a while was a buzzing little surf town 2 hours South West of Auckland called Raglan. While I was there I met a lot of locals who surfed the world class breaks everyday. I also became good friends with a large crew of travelers and backpackers from different countries all over the world. They also all shared a love of surfing, creative expression and of course the not so occasional party. Many of us shared an interest in creativity whether it was Photography, Art, self expression on a Surfboard or Skateboard, or even just vocalizing our love and enjoyment of other art forms. One of these travelers whose artistic skill really stood out to me, was a young Dutch man by the name of Leroy Giesbers. Initially he seemed to be a quiet, reserved traveler and although always joining in on the good times he was often in the background seemingly deep in thought. It was this quiet poise that intrigued me about him and soon after bloomed into a wonderfully mystical art form. Leroy posses a distinctly creative mind. 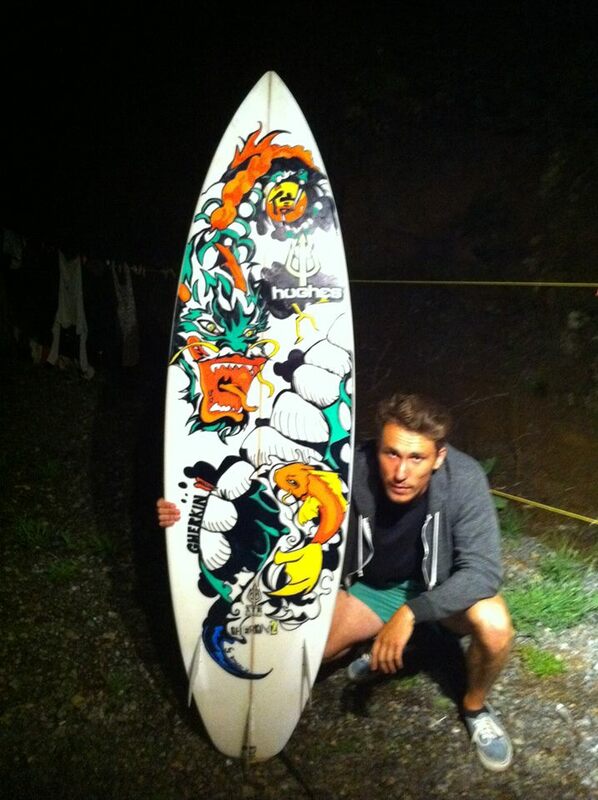 The first thing that blew me away were his beautiful hand-drawn surfboard designs. He executed some extremely intricate designs with complete and utter ease. 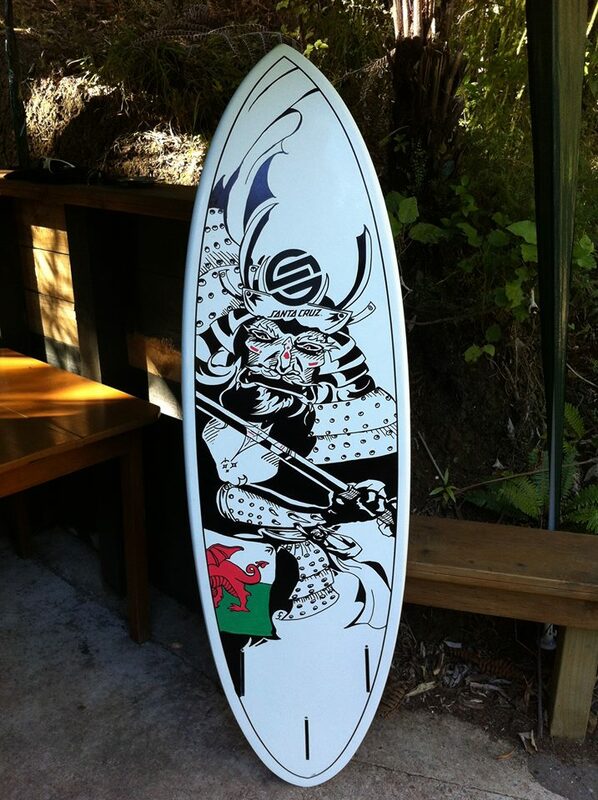 The first design I saw was of a pretty mean looking (Welsh) Samurai Warrior. 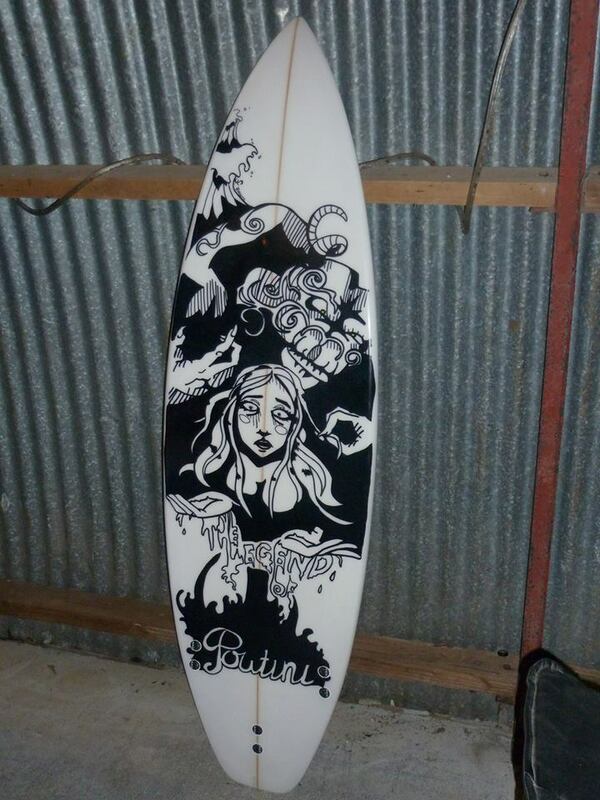 Drawn in black pen on the blank canvas of a Santa Cruz Biscuit owned by Drew. A Welsh born surfer who was spending his Welsh winter in sunny Raglan on the opposite side of mother earth and getting served awesome waves on a daily basis. I stumbled upon Leroy working away like a trooper on this board. He was drawing purely in black marker pen with a little green and red Posca for colour on the Welsh flag. I think he was about 4 hours in and told me he was about half way done! I think you will agree this board came out looking damn fine!! 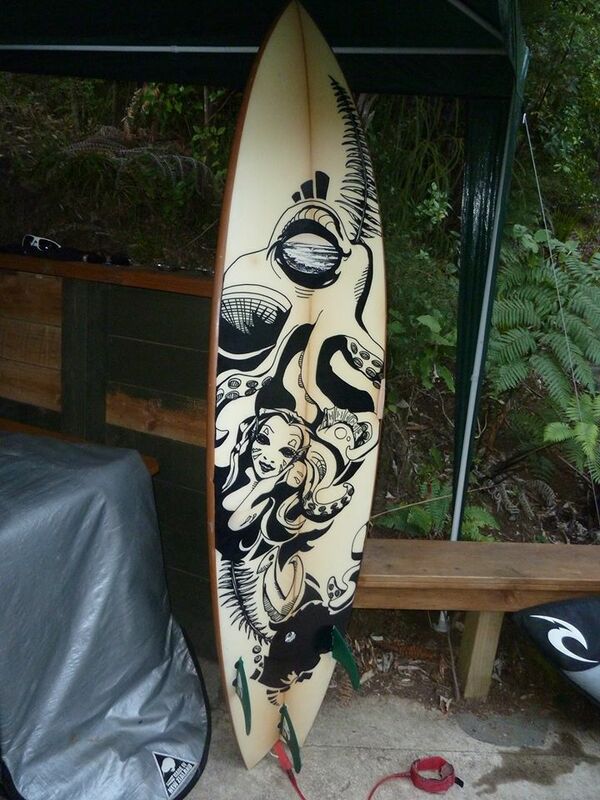 The next board Leroy embarked upon in Raglan was a simple request, from a guy called Hemi. 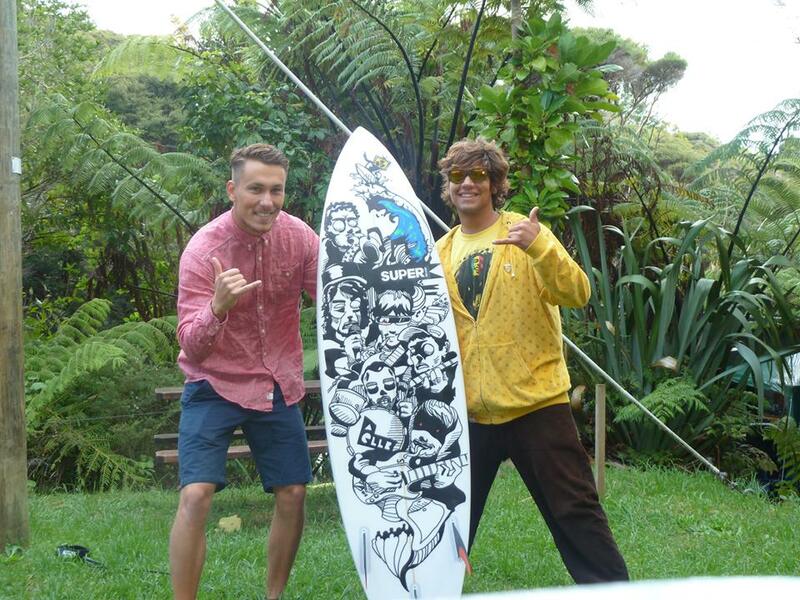 A local to Raglan and one of the surf instructors from the surf school/lodge where we were living that summer. 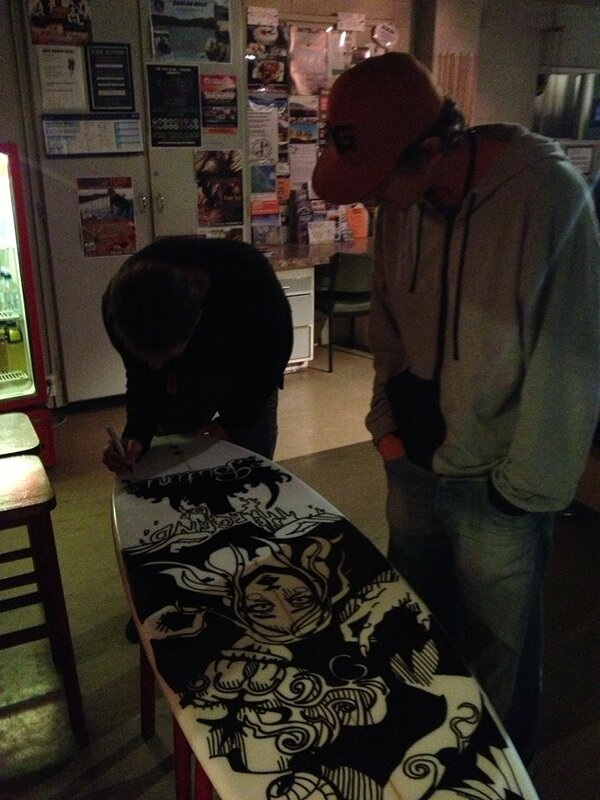 His brief from Hemi was purely the name of his board – Alice. Oh, and his extreme love for nature which needed to be incorporated into the theme of the board. So Leroy used his artistic skill and in his own words endeavored to “Personify Alice and make her soul visible”. A very unfortunate end to this board but maybe it was just encompassing the Rock ‘n’ Roll style of its owner and felt the urge for destruction! One of the many other travelers who past through Raglan that summer was a guy called Matt he lived with us at the Karioi Lodge and whilst there had made a deal or promise with Leroy. 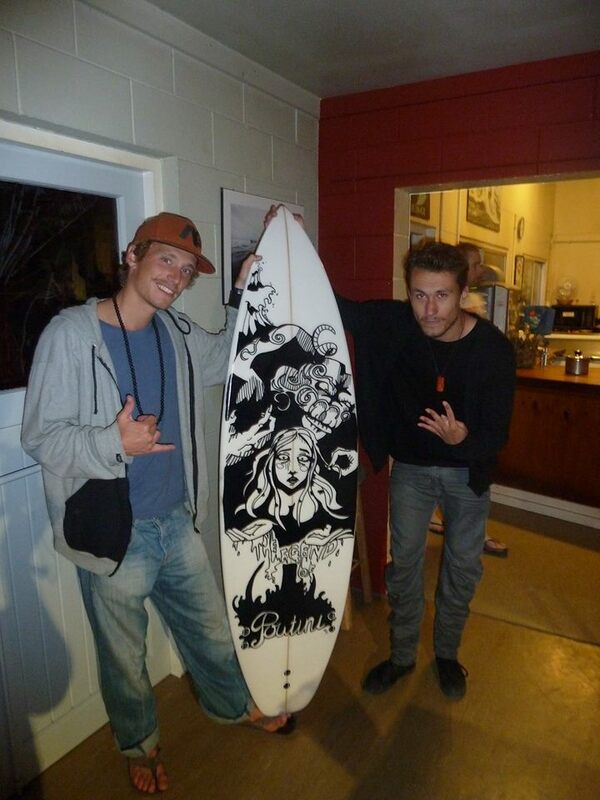 That when he had a surfboard that he really liked and wanted to keep Leroy would do a piece on the board. This didn’t actually happen until the winter of the same year. 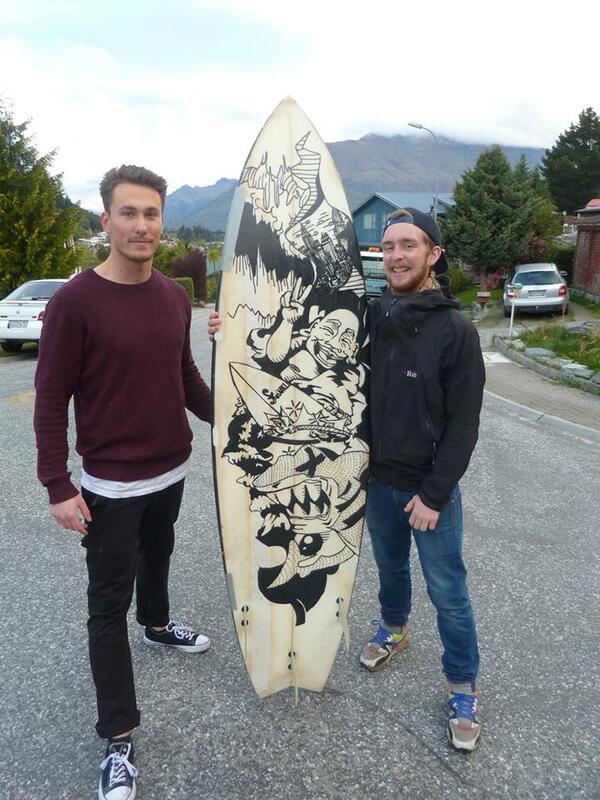 Down in Queenstown, New Zealand’s capital of snow sports and miles from any breaking wave the promise was fulfilled. They met up and another awesome board was produced much to Matt’s delight. Here is the finished product and it’s quite a little beauty. 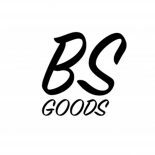 Leroy is now living, working and surfing in Australia and I am pretty sure to say there will be a lot more of his awesomely beautiful surfboards making their way around the southern hemisphere right now!! This entry was posted on November 19, 2014 by jackbutcher04 in Art, Surfing, Travel.